When we released Dateline: Lovecraft as a PDF back in September, we made a promise that we’d use all profits made from its sale to commission extra scenario content to make the Dateline prop even more useful for those who had taken the plunge to purchase it. It took a little while for the sales of the Dateline PDF to recoup the original costs to produce the core product, and also the cost of the first free supplemental PDF, “Help Wanted” which we released as a sample of what the “freebie add-ons” will be like. But by November, we had pretty much done that … and all money raised started going towards paying to commission the second supplement — Noah Lloyd’s “Smoke Green”, released in early January. Now, thanks to a surge in PDF sales (perhaps a side-effect of word getting out about our experimental print run), we have raised enough to pay for a THIRD freebie supplement. 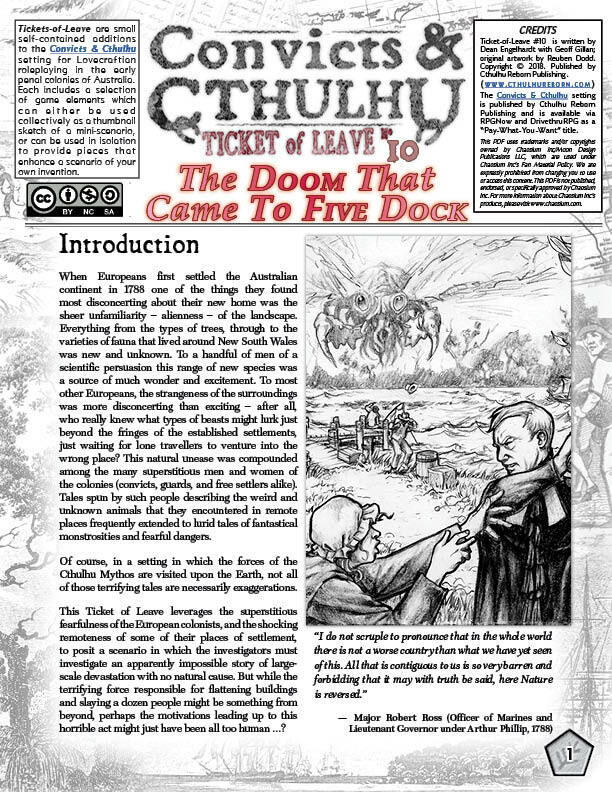 So … without further ado, let me introduce “Spoiled Milk,” a 21 page newspaper tie-in scenario by Jo Kreil, downloadable right now from here on Cthulhu Reborn. 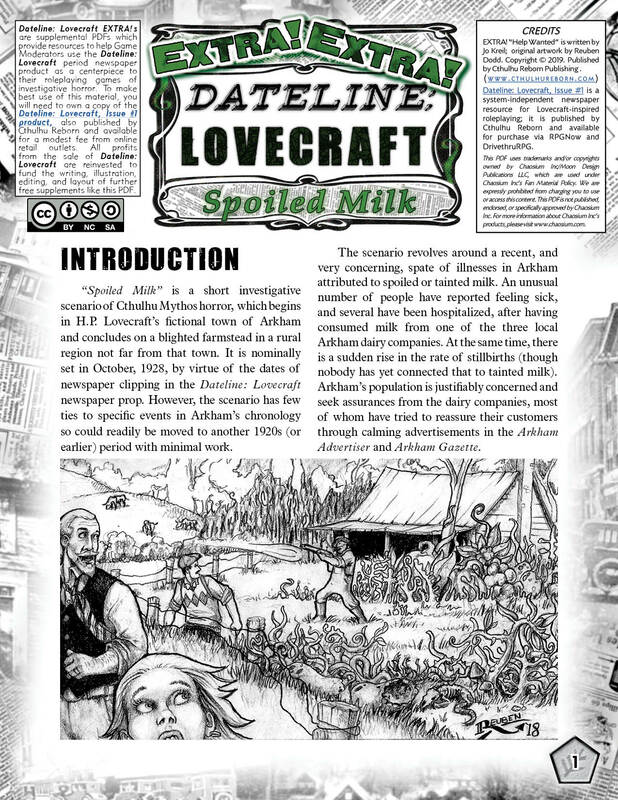 People who have read closely through the Dateline: Lovecraft newspaper prop might have noticed that there is an unusual number of articles which somehow relate to Arkham’s tainted milk, and the deleterious health effects. In fact there are three separate articles peppered through the paper that relate to this one topic … not to mention the three advertisements by local Arkham dairies promoting the uniquely “healthful” nature of their produce. It’s enough to make you wonder if perhaps there is something … up … with Arkham’s milk supply? The always reliable Jo Kreil latched onto this when we asked her to write another scenario to tie-in with Dateline: Lovecraft, penning an interesting scenario which paints a rather unique health scare for Arkham. As is usual with our scenario formats, there isn’t a single weird explanation for the tainted milk epidemic but rather the scenario provides three different options for the GM, each of which will lead to quite a different style of scenario (or at least, supernatural adversary). Whether you like your alien menaces dark, insubstantial and brooding, or potentially planet-destroying and apocalyptic — this scenario has you covered. While it technically needs the Dateline: Newspaper to provide some of the scenario’s key props, an imaginative GM could probably fill in the gaps for themselves if they didn’t want to purchase our product (but we didn’t tell you that). EXTRA! “Spoiled Milk” is a short investigative scenario of Cthulhu Mythos horror,that starts in H.P. Lovecraft’s fictional town of Arkham and ventures out into some of the adjacent countryside. The strange events related in this dark tale from legend-haunted Arkham center upon the public health crisis that has swept to the attention of many locals. Some foul taint seems to have settled upon the milk supplies which are delivered daily to thousands of Arkhamites. People have reported vomiting, bleeding … and other, far, stranger symptoms. The authorities have been aiming to keep a lid on it, but a plucky reporter from the Arkham Advertiser has received an ‘inside tip’ that promises to blow the whole scandal wide open. Downloadable NOW direct from Cthulhu Reborn. Like we said earlier, this free add-on scenario was made possible thanks to the dozens of folks who have bought our PDFs (and also those who have chipped in a dollar or two for these add-ons, which are PWYW over on Drivethru). If you’d like to see more of these tie-in scenarios keep coming from Cthulhu Reborn, you can always spread the word about Dateline: Lovecraft to your friends and gaming colleagues. The more copies we sell, the more free stuff we will make. With this PDF now out in the wild, the “tally” is reset and every dollar raised gets us closer to a FOURTH supplement! 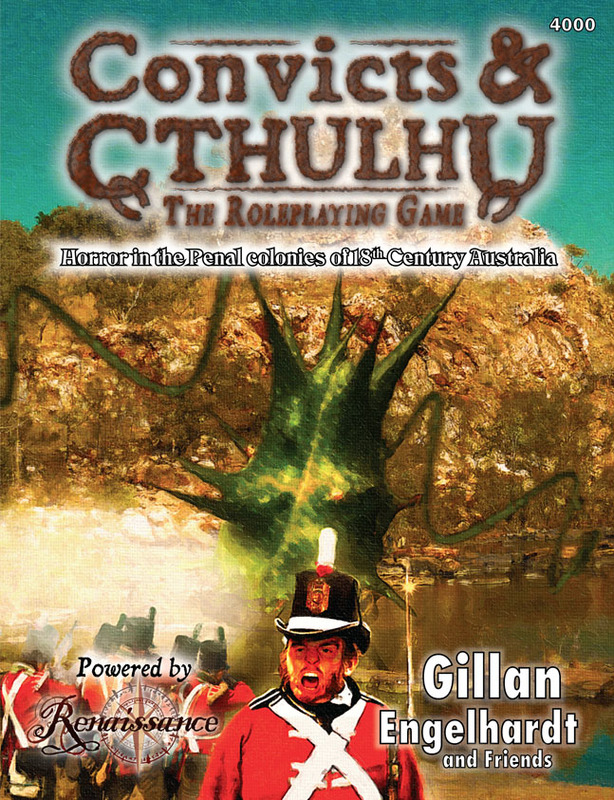 Today we are very excited to announce the release of the second entry into our newest line of support materials for Convicts & Cthulhu, the C&C Musters. We debuted this format back in December — it’s basically a short supplement which examines a real-world historical figure through the lens of their potential for use in a Lovecraftian investigative game scenario. There are lots of ways to use historical character detail as an inspiration for new plots, NPCs, and even investigators — and the goal of the Musters is to give you the tools to do any of these with the background of an intriguing, real-historical figure. 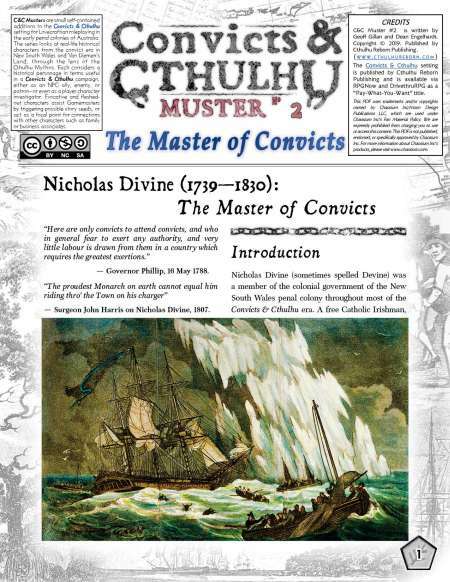 C&C Muster #2, subtitled “The Master of Convicts” focuses on the eventful life of Nicholas Divine (sometimes spelled “Devine”) who served for most of the C&C era in an important government role of “Superintendent of Convicts.” This made Divine the man ultimately in charge of which convicts were assigned to which work gangs or other labour — obviously something that is important to you if you *are* a convict, but also if you are someone whose day-to-day life is enabled by plentiful free convict labour. Perhaps even more interesting than Nicholas Divine’s official life are some of the details of his personal life. Sent out to New South Wales in 1789 aboard the HMS Guardian, Divine was an innocent party caught up in a dramatic encounter which left the Guardian fatally damaged thanks to an unfortunate encounter with an iceberg off the southern coast of Africa. This unusual situation came to be thanks to the ship’s captain making the decision, upon sighting the iceberg, to cautiously approach it to carve off ice to supplement the ship’s limited supplies of fresh water — as a sailing maneuver, it doesn’t go down in history as one of the Royal Navy’s finest (although to be fair to Captain Riou, the sudden night fogs that rose up shortly after the ice carving maneuver really didn’t help). But as an event with potential for exploitation in a Lovecraftian scenario … such an encounter is pure gold. This PDF also includes some additional description of the 18th Century British practice of creating Prison Hulks — non-seaworthy ships converted to floating (temporary) prisons and left floating in the Thames or one of the major shipping harbours. Your convict’s backstory might very well incorporate some time spent aboard a Hulk (none of which BTW warrant the name “incredible,” quite the opposite in fact) … so it’s good to have some historical data to help fill in that part of his or her personal history. C&C Muster #2 is an eight-page PDF available for download right now, from here on the Cthulhu Reborn blog. It has game statistics for the Call of Cthulhu 7th Edition rules. 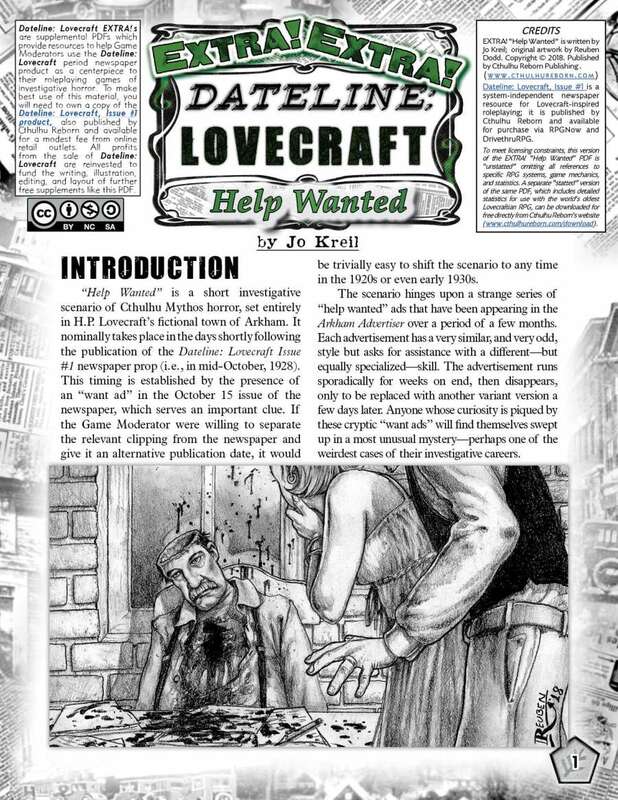 Today we are really, REALLY excited to be announcing the release of a free add-on scenario to our glorious 1920s-Newspaper-themed campaign resource, Dateline: Lovecraft. When we launched Dateline, we said that all revenue we earned from sales of the core product would go back into producing freebie add-on supplements (commissioning talented writers and artists — both old and new — to create them). Today’s release is the first fruit of that promise! For this new DL: EXTRA supplement, Noah Lloyd (an experienced indie writer of online horror RPG seeds) has been kind enough to contribute a rather gruesome newspaper-linked scenario called “Smoke Green”. You can download the 27 page PDF right now, for free, directly from here at Cthulhu Reborn. EXTRA! “Smoke Green” is a short investigative scenario of Cthulhu Mythos horror, set entirely in H.P. Lovecraft’s fictional town of Arkham. When millionaire industrialist Reinhart Laine picked Arkham to be the site of his grand new Tobacco Rolling Factory, few could have predicted the rapid good fortune that his new “Reinhart Cigarettes” would achieve. In a short time, not only were many Arkhamites smoking the new brand of cigarettes — distinguished by their unique green-tinged smoke — but so too were many people in Boston, and cities further afield. The green-smoking cigarettes soon came to be associated with good luck, whether as a result of successful advertising or through anecdotal tales of lucky events befalling Reinhart smokers. The new factory, too, has attracted a great deal of attention, drawing visits from influential industrial moguls and politicians alike. But all is not well at Reinhart Tobacco. When company president Reinhart Laine is found dead in his luxury high-rise office, the Investigators are charged with discreetly looking into the matter. Who could have wanted the wealthy tycoon dead? Were his political affiliations in the bitter race for Arkham’s next Mayor somehow a factor in his death? Or is the closely held “secret recipe” for Reinhart Cigarettes’ distinctive green-smoking tobacco something that a rival company might be willing to kill to find out? Diving into this smoke-filled mystery might just leave the Investigators with questions about who really wields power in the sinuous town of Arkham … and what lengths others would go to to get it. 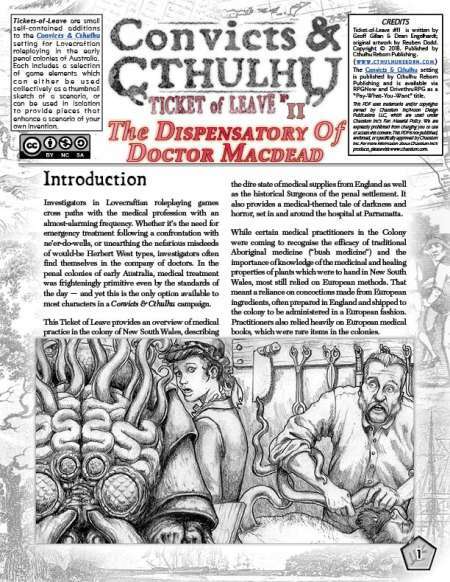 As we mentioned, this supplement was entirely funded out of the income from sales of the core Dateline: Lovecraft newspaper product (which is currently on sale at a reduced price). We hope that more folks consider picking up that PDF, since we already have several more ideas for freebie add-on scenarios which *could* continue to bolster the DL line … if we can afford to commission them! So if you love this free scenario and know of others who might too, please spread the word about our humble newspaper-themed product. The next free scenario is already in development. Well, we’ve been talking about it here on the Cthulhu Reborn blog for several weeks, but today I can finally announce that our newest product line, Dateline: Lovecraft, has hit the streets. 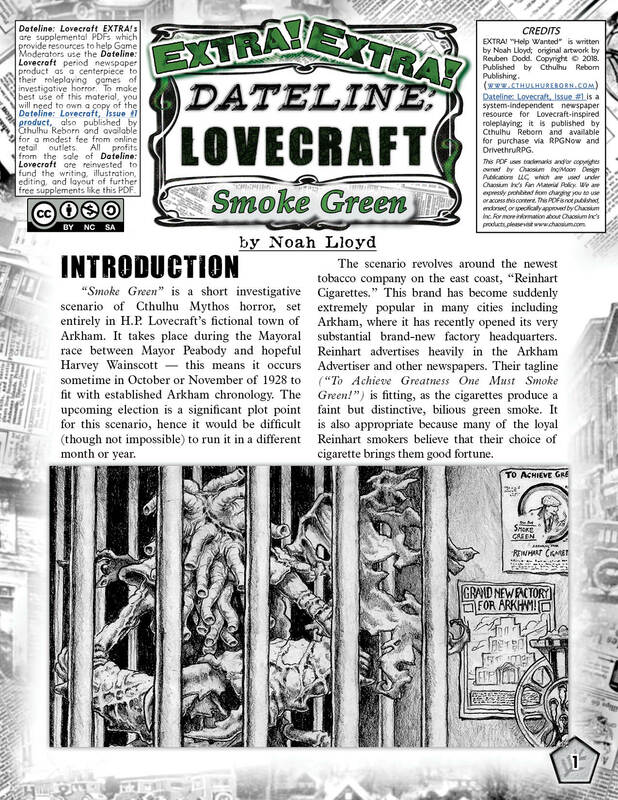 Not only can you right now buy the core Dateline: Lovecraft package (a lavish 12-page period-authentic Arkham broadsheet newspaper) … but we have also released the first in our line of support PDFs for the line. 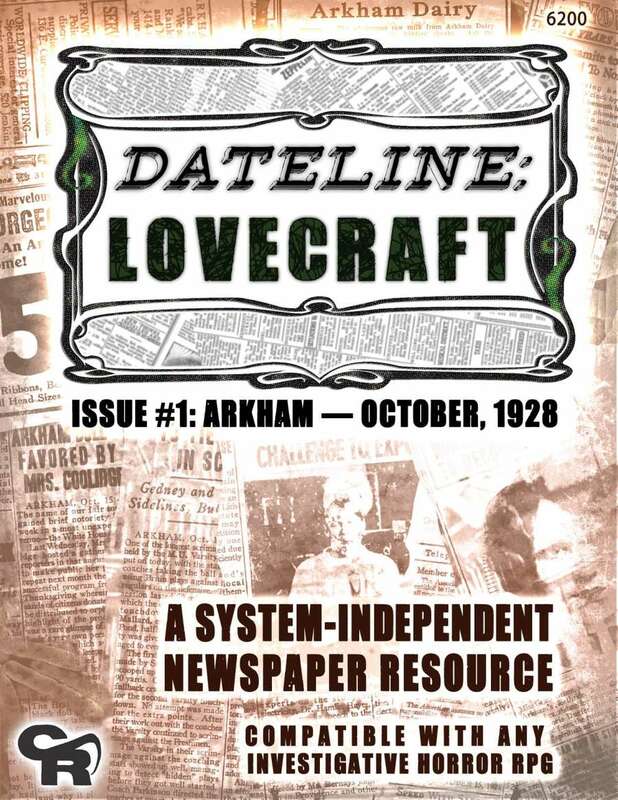 Dateline: Lovecraft Issue #1 is a system-independent resource to help both Game Moderators and players of investigative horror games to bring the town of Arkham to life for their players. Arkham is one of H.P. Lovecraft’s most enduring creations, and a perfect backdrop for dark tales of Cthulhu Mythos terror — and what better way to immerse your players in the “real” Arkham than to provide them with realistic “in-world” artifacts which evoke the unique brooding atmosphere of the witch-haunted college town? 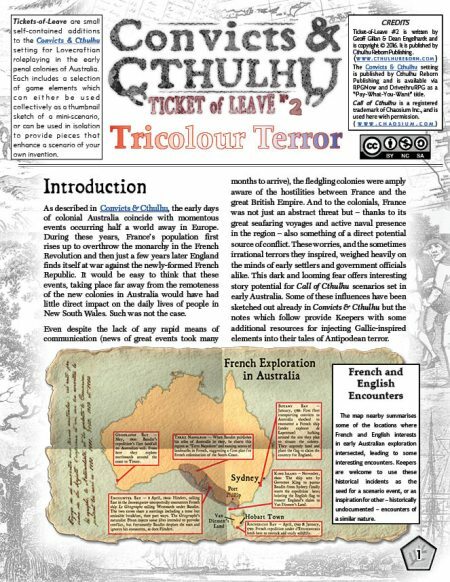 The Dateline: Lovecraft package is, at its core, a massive newspaper-based prop: a PDF copy of an entire 12-page issue of the Arkham Advertiser (the issue for Monday, 15 October, 1928 to be precise). Newspapers of the 1920s typically featured enormous broadsheet pages jam-packed with text and advertising, and our newspaper prop fits that bill too. Each of the 12 newspaper “pages” spans to about 6 sheets of US Letter or A4 paper, and each is packed with thousands of words of news, editorial pieces, advertising, society pages, magazine-style articles, radio programmes, stock quotes, and much more. Buried inside those (usually) innocent-seeming pieces lurk a wealth of odd hooks and details which can be used to inspire or fuel games of investigative horror. Our design goals for Dateline: Lovecraft was to produce something that is meticulously authentic to both the late-1920s era and also to previous game interpretations of Arkham. Rather than producing a joke-y or pulpy scream sheet (with dubious “Shoggoth Loose on Trolley, Again!” headlines) we’ve opted for starting with something that looks like a real newspaper for a smallish Massachusetts university town and then infiltrating weirdness into most of the articles, columns, and sometimes even advertisements. Some of that weirdness is obvious, some remarkably subtle and well-hidden — but all of it is there for you to exploit in your games. For a quick PDF preview of some of the sections of the Guidebook PDF, click here. The Dateline: Lovecraft package is on-sale now at RPGNow and DrivethruRPG. 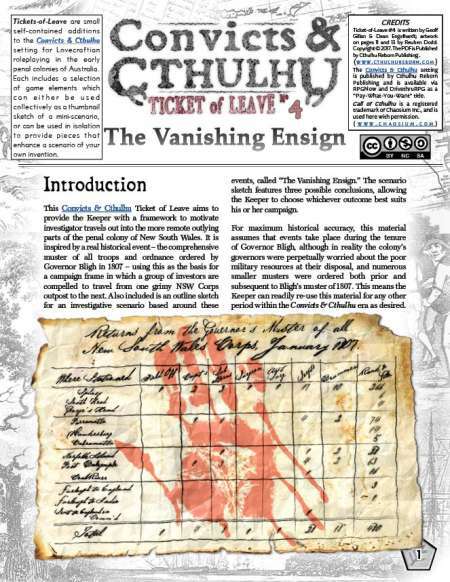 While Cthulhu Reborn is mostly-known for producing high-quality items and then giving them away for free, in this case the amount of writing, art and layout that has gone into both the newspaper prop and support material means that we must release Dateline: Lovecraft as a commercial product (if only to recover our costs). 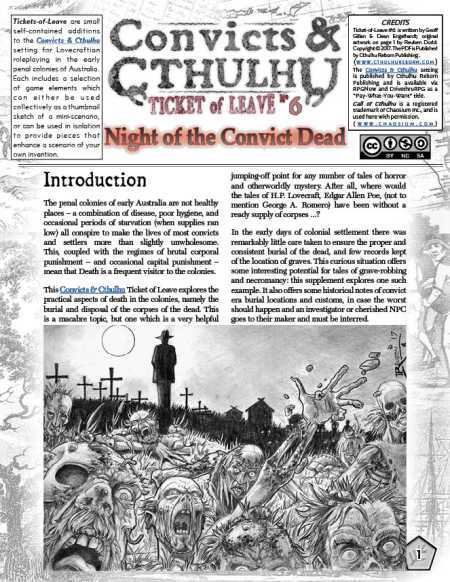 However, as an incentive to buy the product — and also as a thank you to loyal Cthulhu Reborn blog readers — we are hoping to use ALL profits from Dateline: Lovecraft to fund the creation of free (or PWYW) add-on PDFs that enhance the utility of the core newspaper package. 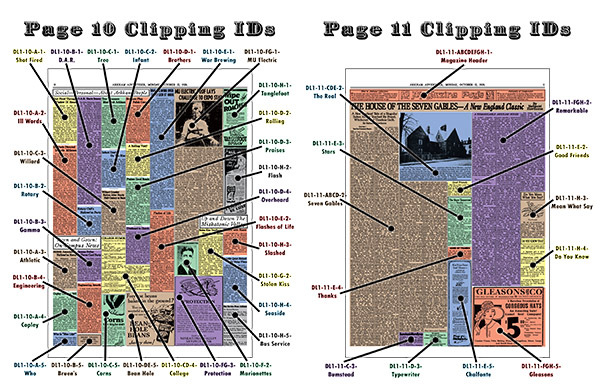 To give you some idea of what those free add-ons will look like, we have already released the first supplemental PDF (which we’re calling “EXTRA!s” in keeping with the old-newspaper-vibe). So, right now you can download a 20-page PDF scenario by seasoned Lovecraftian game writer Jo Kreil (Fear’s Sharp Little Needles, Tales of the Caribbean, Colonial Lovecraft Country). Her scenario is titled, “Help Wanted” and is written to make use of the 7th Edition Call of Cthulhu rules. EXTRA! “Help Wanted” is a short investigative scenario of Cthulhu Mythos horror, set entirely in H.P. Lovecraft’s fictional town of Arkham. The strange events related in this dark tale from legend-haunted Arkham center upon a strange series of ‘help wanted’ advertisements that have been appearing in the Arkham Advertiser over a period of months. Each advertisement has a very similar, and very odd, style but asks for assistance with a different – but equally specialized – skill. The advertisement runs sporadically for weeks on end, then disappears, only to be replaced with another variant version a few days later. Anyone whose curiosity is piqued by these cryptic “want ads” will find themselves swept up in a most unusual mystery – perhaps one of the weirdest cases of their investigative careers. Why would someone have need of such oddly specific skills? What pattern is there in the serial disappearances? How do these events tie in with unbelievable tales about an 18th Century self-style sorcerer from Arkham’s dark past? 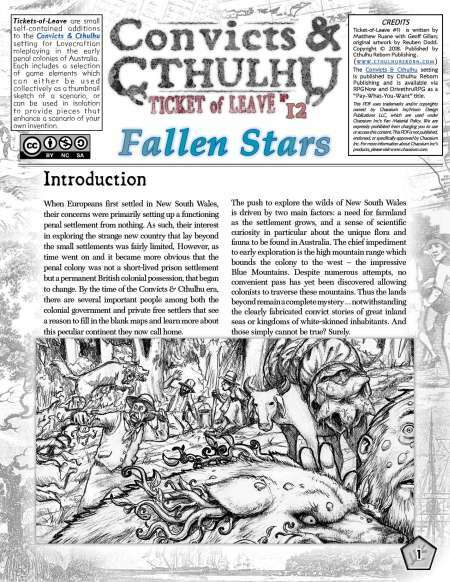 It’s only just over a month since we released the previous title in out Convicts & Cthulhu line … but we find ourselves again today quite breathless with excitement, announcing the release of Tickets of Leave #12: Fallen Stars. This PDF is an exciting release for us, since it brings a brand new writer into the C&C production team, long-time historical RPGer Matthew Ruane (who has a long relationship with Colonial-era Lovecraftian RPGs having run many of the convention previews for Sixtystone Press’ excellent-but-sady-still-forthcoming Colonial Lovecraft Country line). Matthew’s Ticket of Leave weighs in at a respectable 22 pages, and is available for download right now, absolutely free! The format for this supplement is a little more like a traditional convention scenario — which is not surprising, because a version of this scenario will be run at GenCon 2018 in August as our official C&C scenario for the convention. So, if you are already booked into playing on one of the runs of this game in Indy, you may want to hold off reading this Ticket of Leave straight away (or do so with your spoiler-sensitive sunglasses on). 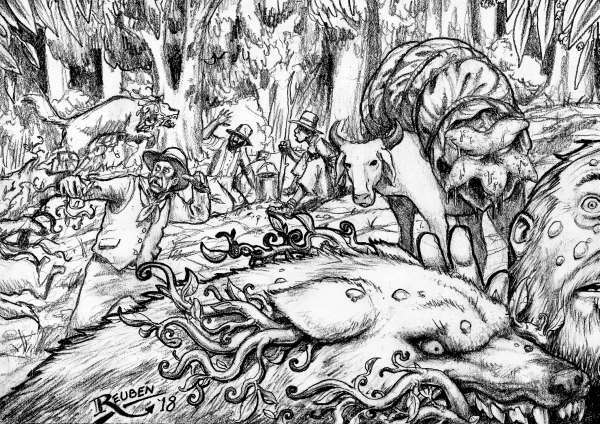 Ticket of Leave #12: Fallen Stars by Matthew Ruane (with some minor historical sidebars by Geoff Gillan) is available right now as a free download from the Cthulhu Reborn blog. The version linked here is complete with game statistics for the Call of Cthulhu, 7th Edition (under Chaosium’s fan license). As with other recent releases, we have been obliged by Chaosium’s somewhat arbitrary licensing rules to also create a stat-free version of the supplement for release via RPGNow and DrivethruRPG. We would encourage you to share the links to either or both of these versions with your personal network of Lovecraftian RPG enthusiasts. The more free stuff out there in the wild, the better for everyone! This release also brings us back into our regular bi-monthly schedule of releases (after April’s release being delayed); so from here we’re aiming for another Ticket around GenCon time, one around Halloween, and maybe even a third Convict Christmas-themed supplement. 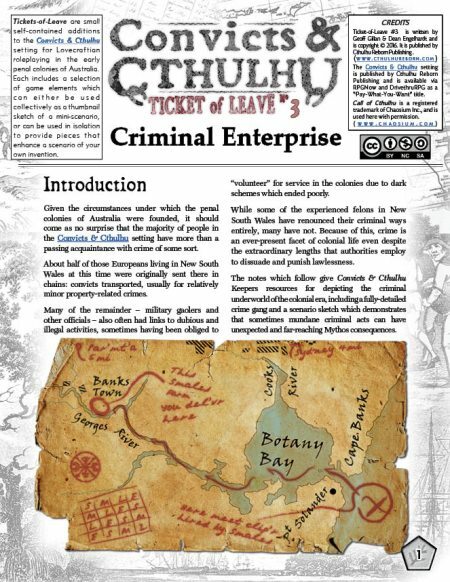 Believe it or not, today marks the two-year anniversary of our first publication of Convicts & Cthulhu, a setting for Lovecraftian horror roleplaying in the early penal settlements of Australia. In the months since it’s original publication, we have been supplementing the original C&C setting by publishing a series of PDF releases under the “Tickets of Leave” series. Our initial goal was to release one of these every two months — and amazingly we have largely been able to keep to this release tempo, having now released 11 Tickets of Leave. While we initially planned for these to be small, free supplements (a little like the “one sheets” popular for Savage Worlds) … the needs of a mystery-based game have meant our supplements have been more substantial (and continue to grow moreso). They are still all obtainable free-of-charge, or Pay-What-You-Want if you shop via RPGNow. Convicts & Cthulhu [96 pages]. This is the core setting book (with CoC 7e game statistics): this is the flagship book in our C&C line — at least until our release of the standalone Convicts & Cthulhu RPG, which is still in development. 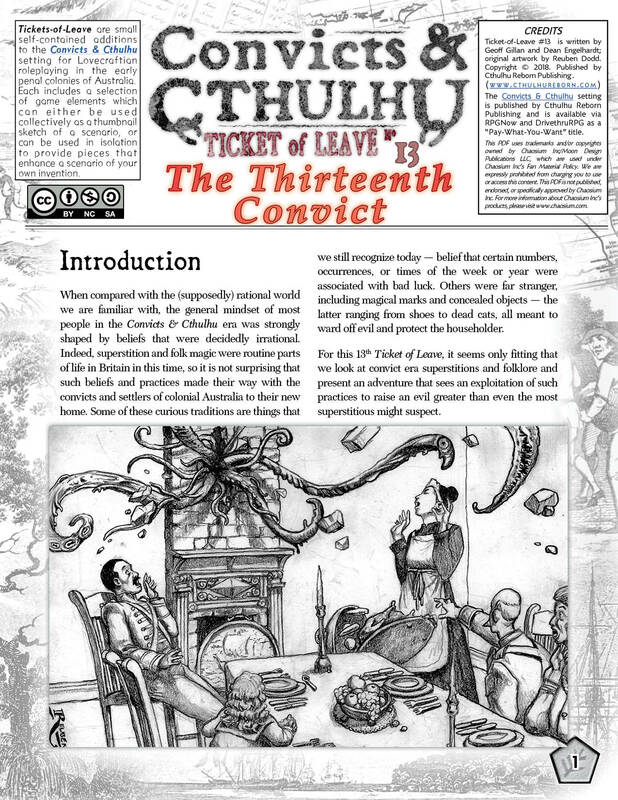 Convicts & Cthulhu, Player’s Edition [57 pages]. A cut-down version of the above which focuses on the setting and the information required by players creating convict (or settler, or aboriginal) investigators. Ticket of Leave #1: Night Terrors [4 pages]. 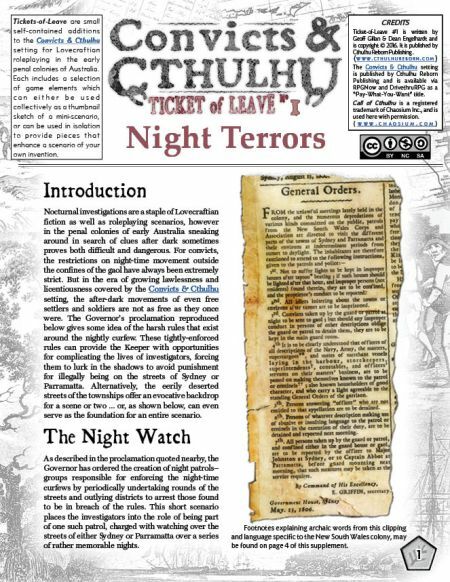 Our very first “Ticket of Leave” supplement contains information about the Night Watch, a nocturnal patrol created by the early penal settlements. As well as describing character options and encounters typical to a Night Watch campaign, the PDF includes a short sketch of scenario involving an incompetent cultist and the messy consequences of a summoning that didn’t go as planned . . . Ticket of Leave #2: Tricolour Terror [6 pages]. This supplement explores the rather tense relationship between the British penal colony and the French ships which occasionally visited; an antipathy fuelled by the on-again-off-again war between Britain and France in the era. As well as including character options (including French spy!) 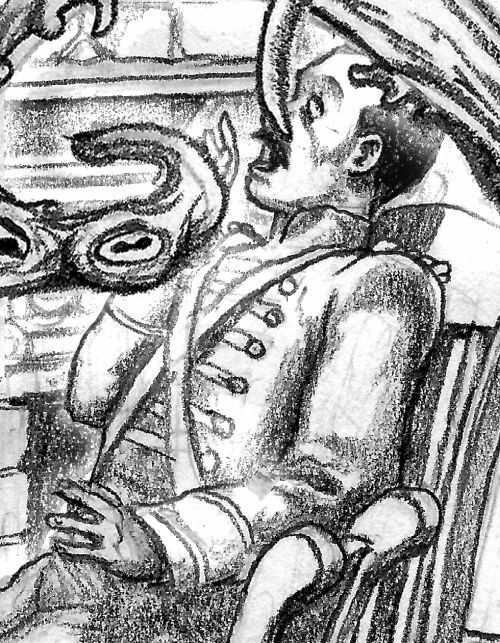 it has a scenario which begins when a French ship limps into Sydney Harbour with a tale of running into a strange creature at sea … is this a true account of a Mythos horror, or just an attempt to gain the trust of the Colonial authorities for nefarious purposes? Ticket of Leave #3: Criminal Enterprise [8 pages]. This “Ticket of Leave” explores the phenomenon of criminal gangs within the penal settlement. A good proportion of those in the colony are there for their illegal dealings … so is it any surprise that some continue their criminal enterprises even once inside the prison settlement? As well as notes on playing criminal gang members (and a ready-made gang of ne’er-do-wells), the supplement includes a scenario based around a smuggling deal that takes a serious turn for the weird thanks to some rather … odd … clients. Ticket of Leave #4: The Vanishing Ensign [14 pages]. This supplement explores the historical “musters” that took place periodically in the early colonies — massive census-like exercises in which a small team was sent into every corner of the colony to tally up the population, arms, and other defences to determine the colony’s readiness for attack. It features a scenario based around a mysterious sailor whose name appears on many different official records in numerous places around the colony … but nobody seems to be able to locate. 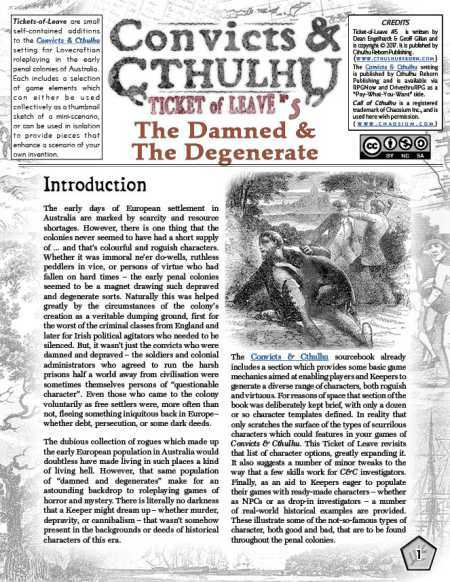 Ticket of Leave #5: The Damned & The Degenerate [24 pages]. When the core Convicts & Cthulhu book was published there was only limited space to outline profession templates for “investigators”. This PDF greatly expands upon the list in the core book providing dozens of additional occupations for players to roleplay … all the way from Aboriginal trackers to colonial undertakers. It also includes some slight tweaks to the skills list in the core book. There is a revised C&C fillable character sheet that goes along with these changes. 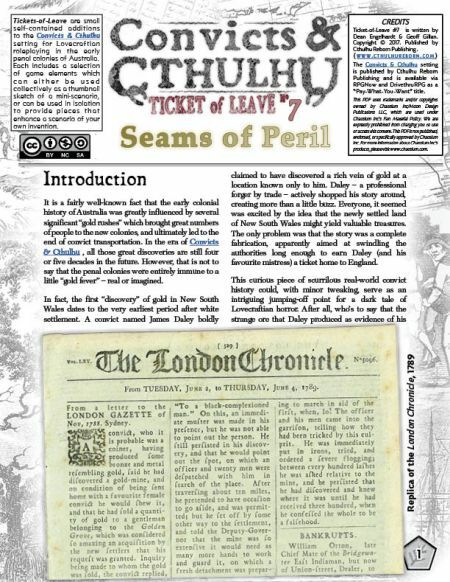 Ticket of Leave #7: Seams of Peril [14 pages]. Later history of Australia is heavily shaped by the gold rushes that brought many to Antipodean shores … but decades before that, shameless convicts were not above faking “gold strikes” and bargaining authorities to exchange their early release for the “secrets” of their discovery. 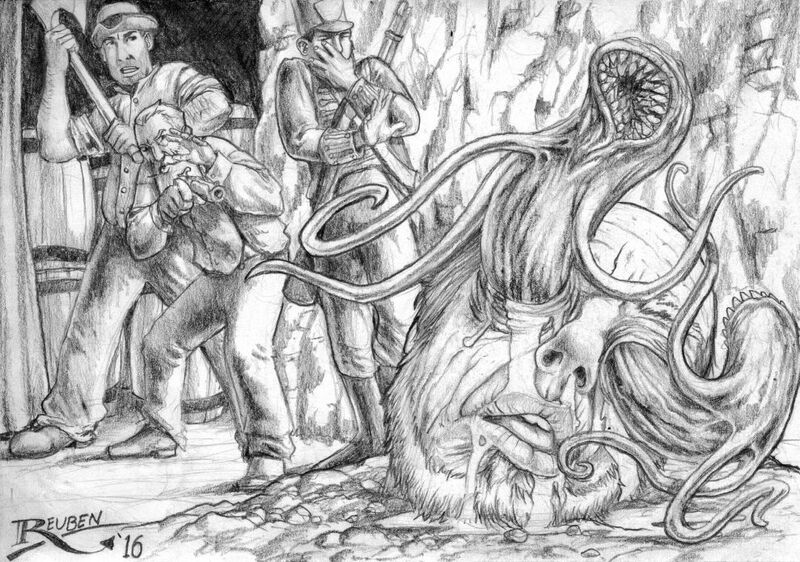 The supplement includes a scenario about an audacious convict that tries just such a scam … but the location he picks for his phony mine is somewhere that he (and the investigators) would be better not to visit. But their mission is to accompany him to exactly that place. 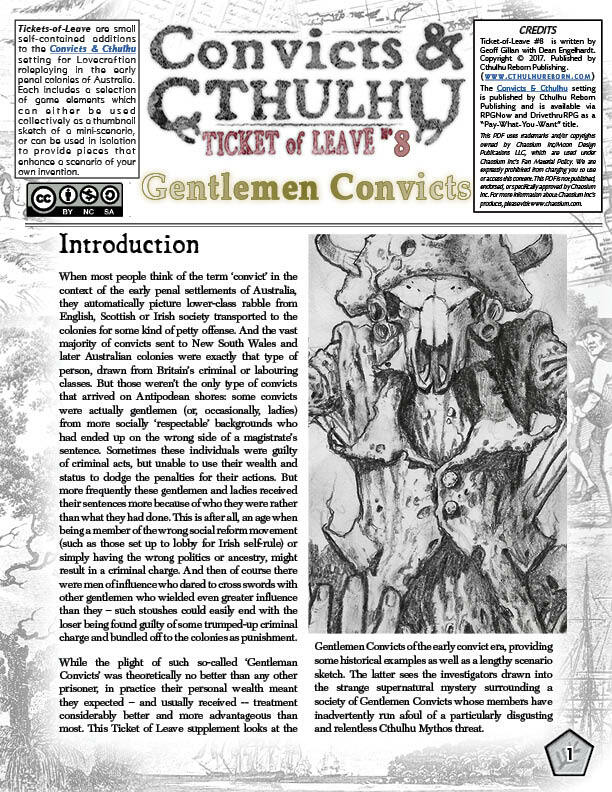 Ticket of Leave #8: Gentlemen Convicts [20 pages]. While the majority of convicts sent to Australia were from the lower classes of British society, there were exceptions — so-called “Gentlemen Convicts” who were sentenced to transportation despite their relative wealth. These elite prisoners had a range of special priveleges, and a kind of society of their own. This “Ticket of Leave” features a scenario centering on just such a group, haunted by a curious and apparently spectral ‘stalker’. Who is behind the brutal murders of the society? And what strange and supernatural hand fashions such gruesome deaths for the gentlemen convicts? 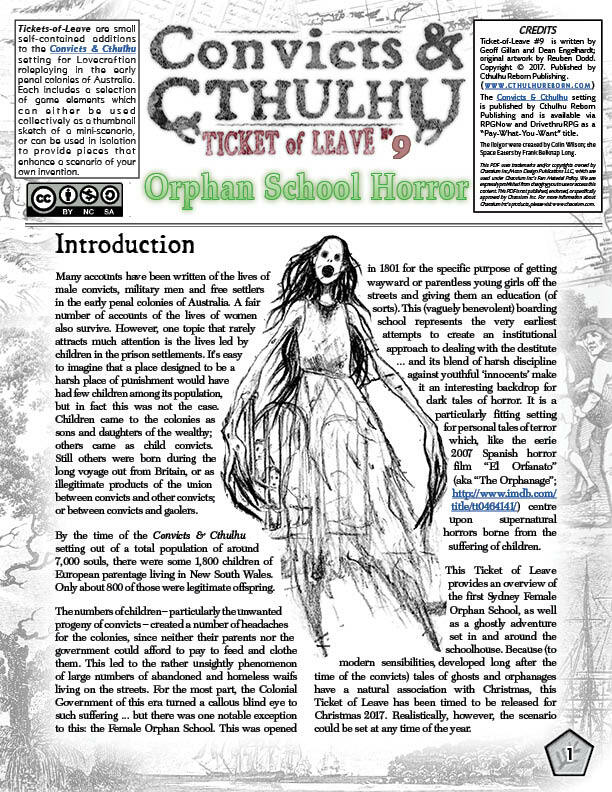 Ticket of Leave #9: Orphan School Horror [23 pages]. This “Ticket of Leave” is our (vaguely) Christmas themed release, centering upon the only benevolent institution in Sydney township, the Female Orphan school. This worthy establishment was set up to ease the problems of unwanted children on the streets. The scenario included has a decidedly “ghostly” theme: several of the female orphans at the school claim to have seen strange poltergeist-type manifestations. But there is a lot more going on that just a mere ghostly manifestation … and investigators had best hurry to solve the mystery before whatever lurks in the school succeeds in its mission to break through into our world. Ticket of Leave #10: The Doom That Came To Five Dock [17 pages]. This supplement is a scenario-only release that describes a Mythos-heavy manifestation of doom in a remote riverside ferry station between Sydney and Parramatta. Can the tales of frightened ferryboat captains be believed; lurid stories which claim that Five Dock station was reduced to splinters by a massive and terrifying … insect horror?